SUPERMAN: "I'm here to fight for truth, justice and the American way." Superman fan film, A Smallville Man. A stand alone Superman movie is slated for 2018. Hans Zimmer to score Batman V. Superman: Dawn of Justice. 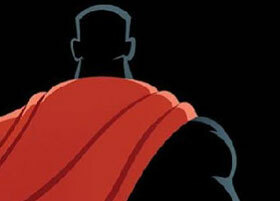 Man of Steel director Zack Snyder and Bruce Timm's animated short tribute. 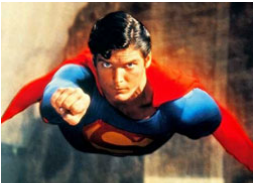 Super-Fact: Superman was introduced in 1938 In Action Comics number one. CAPTAIN AMERICA: "People are going to die. I can't let that happen." Captain America will face off against Ironman in a Cival War influenced storyline in Captain America 3. Captain America Winter Soldier now on DVD and Blue Ray. Captain America 3 and Batman vs. Superman will not be going head to head on May 6th 2016. Avengers 2 hits theaters May 1st. Captain America is one of 20 Marvel characters that will be included in a new video game: Disney Infinity: Marvel Super Heroes. Captain America: Winter Soldier receives rave reviews and breaks records at the box office. Captain America to appear on Disney Cruise ships: Avengers Academy campaign. 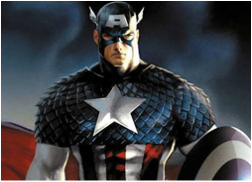 Cap-Fact: Captain America came out in 1941, nine months before the bombing of Pearl Harbor. Jada Pinkett Smith's "Fish Mooney" is leaving Gotham. Tim Burton's Batman celebrates 25 years! A stand alone Batman film is scheduled for 2019. IRONMAN: "Don't waste it... don't waste your life, Stark." Robert Downey Jr. gives a child an ironman arm. Marvel states there are no plans for an Ironman 4. Stark Industries attraction is featured at Disneyland, CA Tommorowland and displays all of the Ironman suits from the feature films. Ironman will is one of 20 Marvel characters that is included in the video game: Disney Infinity: Marvel Super Heroes. Robert Downey Jr. signs on for two Avengers movies. 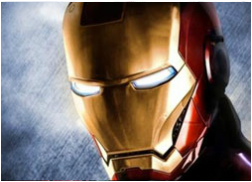 Iron-Fact: Ironman/Tony Stark was almost played by Tom Cruise. WONDER WOMAN: "Hiding like cowards is not the amazon way." Batman V. Superman's first look at Gal Gadot as WonderWoman. Wonder Woman comic books get a new husband and wife creative team. HEROIC WORLD FEATURE! Wonder Woman Fan Film's get fans attention. WonderWoman will get a stand alone movie in WonderWoman in 2017 starring Gal Gadot. 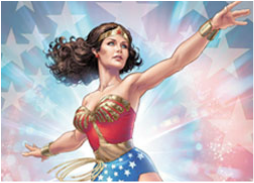 Wonder-Fact: Wonder Woman and her magic lasso of truth were invented by William Moulton Marston, the inventor of the polygraph machine. SPIDERMAN: "We need a hero, courageous sacrificing people, setting examples for all of us." Tom Holland cast as Spiderman. 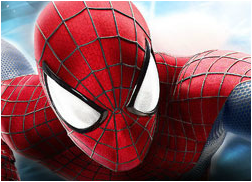 Spiderman swings over from Sony to Marvel Studios. Peter Parker returns to The Amazing Spiderman comic books. Spidey-Fact: Spiderman's black costume came from the Beyonders planet in the Secret War. GREEN ARROW: "I'm not super. Any talents I have, I worked for." 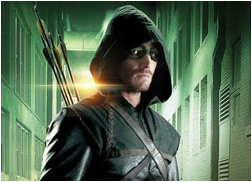 Green Arrow-Fact: Mort Weisinger's creation was inspired by Robin Hood and a movie serial, The Green Archer. X-MEN: "Second best don't cut it, bub!" Hugh Jackman says goodbye to Wolverine after 17 years. X-Men: Apocalypses gets some new cast-mates. A Gambit film starring Channing Tatum is expected to come out in 2016. Bryan Singer X-Men: Apocalypses is based on the comic book series in 2016. 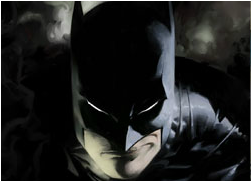 He brings back X-Men writers Michael Dougherty and Dan Harris. 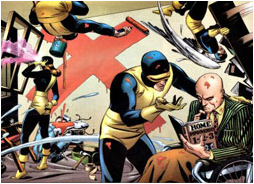 X-Fact: Within the Marvel Universe, the X-Men are widely regarded to have been named after Professor Xavier himself. JUSTICE LEAGUE OF AMERICA: "The real test of honor isn't how you die, it's how you live." Aquaman will be starring in his own feature filmto be directed by James Wan. Aquaman will be starring in his own feature film. Justice League is coming to the big screen directed by Zach Snyder. 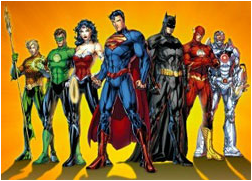 The Justice League movie roster will include, Superman, Batman, Aquaman, Cyborg and WonderWoman. Expect more to come. Batman Begins director Christopher Nolan is said to have been asked to oversee the JLA film as he did with the upcoming Man of Steel with Henry Cavill and Ben Affleck to star. JLA-Fact: Michael Rosenbaum is the voice of the Flash on the Justice League Animated series. He also portrayed Lex Luthor on Smallville. AVENGERS: "If we can't protect the Earth, you can be damn sure we'll Avenge it." 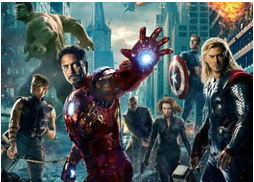 The Avengers roster will change for Avengers 3. Avengers 2 Age of Ultron official website. Avenger-Fact: The Avengers" originally consisted of Iron Man, Thor, Hulk, Ant-Man and Wasp.